Autophagy is a conserved trafficking pathway that is highly regulated by environmental conditions. During autophagy, portions of cytoplasm are sequestered into a double-membrane autophagosome and delivered to a degradative organelle, the vacuole in yeast and the lysosome in mammalian cells, for breakdown and recycling. Autophagy is induced under starvation conditions and in mammalian cells is also invoked in response to specific hormones. In yeast, under nutrient-rich conditions, a constitutive biosynthetic pathway, termed the cytoplasm to vacuole targeting (Cvt) pathway, utilizes most of the same molecular machinery and topologically similar vesicles for the delivery of the resident hydrolase aminopeptidase I to the vacuole. Both autophagy and the Cvt pathway have been extensively studied and comprehensively reviewed in the past few years. In this review, we focus on the yeast system, which has provided most of the insight into the molecular mechanism of autophagy and the Cvt pathway, and highlight the most recent additions to our current knowledge of both pathways. Cellular homeostasis is controlled by balancing protein synthesis and degradation. This balance is maintained through various regulatory mechanisms that sense the environmental conditions and transduce specific signals into particular growth and developmental responses. In the case of degradation, these responses may be involved in adaptation to specific nutrients, or may play a role in survival under different stress conditions. In eukaryotic cells, there are 2 major avenues for large-scale macromolecular degradation. The proteasome localizes to the cytosol and nucleus and mediates ubiquitin-tagged protein degradation. Because of its localization and structural constraints, the proteasome is limited in terms of its degradative capacity. In contrast, a compartmentalized organelle, such as the lysosome in animal cells or the equivalent vacuole in yeast, constitutes a lytic environment that comprises a variety of hydrolases. Due to its topological segregation from the cytoplasm, the lytic compartment can accommodate the degradation of any cellular components, including entire organelles. The major trafficking pathway that delivers cargo to the lysosome/yeast vacuole for degradation is autophagy (1). It should be noted that the term “vacuole” is used by researchers studying mammalian autophagy to denote membrane-bound cytosolic compartments that are involved in the initial stages of autophagy and/or endocytosis. In yeast, “vacuole” refers only to the analogue of the lysosome. Because we focus on yeast in this review, the term “vacuole” is used to designate this organelle. Morphology of autophagy pathways in yeast. Autophagy is the membrane-trafficking pathway that delivers cytoplasmic material to the vacuole for degradation and recycling. Macroautophagy involves the formation of a cytosolic double-membrane vesicle, an autophagosome, which sequesters bulk cytoplasm. Upon completion, autophagosomes fuse with the vacuole membrane releasing a single membrane autophagic body inside the vacuole lumen. The autophagic body is degraded by vacuolar hydrolases. During microautophagy, the sequestration event occurs directly at the vacuole surface. The process also results in a single-membrane vesicle that is ultimately degraded inside the vacuole. Peroxisomes can be selectively taken into the vacuole for degradation by the pexophagy pathway, a specific type of autophagy. Whereas macropexophagy requires the formation of a sequestering vesicle in the cytosol, micropexophagy occurs directly at the vacuole surface. While autophagy has been studied in mammalian cells since the 1960s, it has been the application of yeast genetics that has allowed us to develop a molecular understanding of this process. Autophagy can be broken down into a few basic steps: signaling, sequestration of cytoplasm, completion of vesicle formation, targeting of the completed vesicle to the lysosome/vacuole followed by docking and fusion, and breakdown (Figure 2). Proteins involved at each of these steps have been identified in the baker’s yeast, Saccharomyces cerevisiae. Homologues of the yeast autophagy genes have now been discovered in cells from humans, Drosophila, Dictyostelium, Arabidopsis, and Caenorhabditis elegans (1). 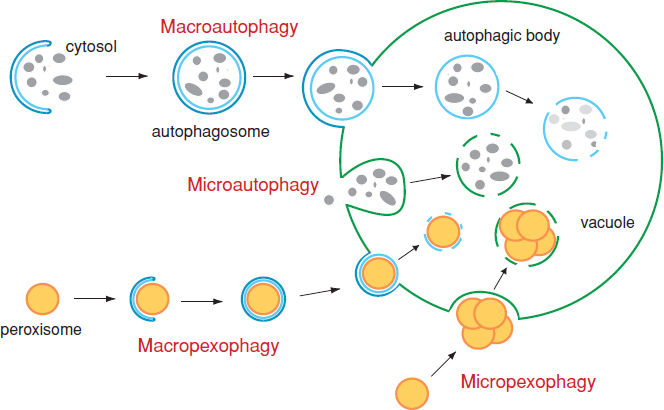 In the last few years, autophagy has attracted increasing attention because people have started to realize that autophagy is not simply a degradative process; it appears to play critical roles during development. For example, programmed cell death (PCD) is important in various developmental pathways. While apoptosis is the best-known type, PCD can occur in more than one way. Besides apoptosis, which is now referred to as type I PCD, autophagy is characterized as type II PCD (4). One of the primary differences between types I and II PCD concerns their morphological manifestations. Type I PCD involves fragmentation of the chromatin and condensation of cytoplasm, whereas type II PCD is marked by the appearance of autophagosomes. Apoptosis can activate autophagy and, at least in some cases, autophagy is required for efficient apoptosis (5). On the other hand, autophagic dysfunction is associated with various diseases (reviewed in 6). For example, following the identification of the Apg and Aut autophagic protein components (Table 1), investigators found a correlation between defects in autophagy and carcinogenesis. Beclin, a mammalian homologue of the yeast autophagy protein Apg6, is a candidate tumor suppressor (7). Beclin has been shown to be involved in mammalian autophagy and functions in an analogous way to its yeast homologue as a component of a phosphatidylinositol (PtdIns) 3-kinase complex (see below; 8). In addition to cancer, defective autophagy is correlated with a number of neurodegenerative diseases, such as Huntington’s and Parkinson’s diseases (6). Schematic model of the steps involved in autophagy. Under starvation conditions a signal transduction event results in the inactivation of Tor kinase and the induction of autophagy. Membrane from an unknown source nonspecifically sequesters cytoplasm. The resulting doublemembrane autophagosome targets to and fuses with the lysosome/vacuole. Fusion allows the release of the single-membrane autophagic body that is subsequently degraded in the lysosome/vacuole lumen allowing the recycling of cytoplasmic constituents. A major breakthrough in the study of autophagy came from analysis of the biosynthetic cytoplasm to vacuole targeting (Cvt) pathway in yeast. One of the major problems in analyzing autophagy has been the lack of markers to monitor its progression. Mammalian cell studies have usually relied on electron microscopy to follow the appearance of autophagosomes; however, this is time consuming and it can be problematic to make definitive identifications of these compartments. A similar problem existed in yeast before the analysis of the Cvt pathway. The Cvt pathway is utilized for the delivery of a resident hydrolase, aminopeptidase I (Ape1), into the yeast vacuole. Ape1 is synthesized as a precursor form (prApe1) in the cytosol, forms a large oligomeric complex, and is transported directly to the vacuole without transiting through the secretory pathway (1). The transport pathway requires the formation of a 150 nm double-membrane Cvt vesicle that specifically sequesters the prApe1 complex before it fuses with the vacuole. Subsequent breakdown of the single-membrane Cvt body within the vacuole lumen allows maturation of prApe1 through proteolytic removal of its propeptide. This maturation event can be conveniently monitored kinetically as a molecular mass shift using sodium dodecyl sulfate-polyacrylamide gel electrophoresis. Figure 3 shows the schematic events of both autophagy and the Cvt pathway in yeast. Molecular genetic and biochemical approaches have revealed that the genes required for autophagy in yeast, APG and AUT, overlap extensively with those needed for the Cvt pathway, CVT (see Table 1). In addition to these pathways sharing most of the molecular components, the cargo protein for the Cvt pathway, prApe1, is delivered to the vacuole by autophagy under starvation conditions. Therefore, prApe1 serves as a useful marker to follow both the Cvt pathway and autophagy. Because most of the protein components appear to overlap, the Cvt pathway can be viewed as a type of selective autophagy. As noted above, pexophagy is another type of selective autophagic process. Thus, studying the Cvt pathway will help us understand how the cell carries out selective autophagy, including such aspects as cargo recognition and packaging. Whereas these pathways are similar in overall features and membrane topology, they differ with regard to their regulation, size of the transport intermediates, and possibly the membrane sources for the sequestering vesicles (see below). Working models for autophagy and the Cvt pathway in the yeast S. cerevisiae. Both pathways require a membrane nucleation step followed by the formation of double-membrane vesicles. The type of vesicles that are produced depends on the nutrient conditions. Autophagosomes (300 to 900 nm diameter) form during autophagy under conditions of nutrient deprivation. Cvt vesicles (140 to 160 nm diameter) are generated through the Cvt pathway under nutrient-rich conditions. The subsequent fusion of the vesicle with the vacuole membrane results in autophagic bodies or Cvt bodies that are ultimately degraded. The degradation process allows the precursor form of the resident hydrolase aminopeptidase I (prApe1) to be processed into its mature form (mApe1). While the biosynthetic Cvt pathway selectively packages and transports prApe1 under nutrient rich conditions, prApe1 is able to be transported through autophagy during starvation. This review focuses on the yeast S. cerevisiae. The comparison of autophagy and the Cvt pathway helps in understanding the underlying issues involved in regulation and induction. Therefore, we begin with the discussion of the regulation for both pathways. How the sequestering transport vesicle is formed is one of the most important issues in the protein trafficking field. Typical endomembrane transport vesicles, such as those used during biosynthesis to deliver nascent proteins between organelles, undergo a series of processes including coating and budding from the donor membrane, uncoating, docking, and fusion with the acceptor compartment. During the formation of these transport vesicles, subcellular topology is maintained-the lumenal contents of organelles are maintained within the equivalent of the extracellular space. During the formation of Cvt vesicles and autophagosomes, the cargoes undergo a change of topology-cytoplasmically oriented material is ultimately transferred to the lumen of the vacuole. In addition, the current data suggest that Cvt vesicles/autophagosomes do not bud off from pre-existing organelles. For these reasons, biogenesis of these vesicles is likely to be quite complex. Accordingly, much of this review highlights recent results that reveal a novel structure involved in both autophagosome and Cvt vesicle formation/assembly. This structure is 1 key to understanding both pathways and will be the focus of future research aimed at dissecting the source of the sequestering membrane and the mechanism of vesicle formation. In yeast, autophagy is maintained at a basal level and the Cvt pathway operates constitutively in nutrient-rich conditions. Upon shift to starvation conditions, autophagy is significantly induced. The putative nutrient sensor on the cell surface appears to transduce the starvation signal through the Tor pathway to regulate autophagy (Figure 4). As a well-characterized example, in yeast, Tor2 regulates the activity of protein phosphatase 2A (PP2A)-related catalytic subunits, such as Sit4, through phosphorylation of the regulatory subunit Tap42; phosphorylated Tap42 binds and inhibits Sit4. In starvation conditions, Tor2 is inhibited, resulting in the dephosphorylation of Tap42, its subsequent displacement from the PP2A catalytic subunits, and their resulting activation (9). The activated phosphatases control the activity of transcriptional activators, thus regulating various downstream events. Inhibition of Tor induces autophagy in yeast, yet it appears to do so independent of Tap42. The downstream effector of Tor that is involved in regulating autophagy has not been identified. Autophagy proteins that function in response to the Tor2 signaling cascade include a phosphoprotein, Apg13, and a protein kinase, Apg1 (10). Under nutrient-rich conditions, Apg13 is hyperphosphorylated and maintains a weak interaction with Apg1. Inhibition of Tor causes dephosphorylation of Apg13, which increases its affinity for Apg1. Interaction with Apg13 is thought to regulate Apg1 kinase activity. The 2 proteins are part of the vesicle biogenesis machinery required for both the Cvt and autophagy pathways (see below). The Tor signaling pathway is conserved in mammalian cells. However, the downstream machinery that controls autophagy might be regulated differently because some identified proteins that interact with Apg1, including Apg13, appear to lack homologues in some higher eukaryotes. The Tor kinase is a key regulatory component that controls induction of autophagy. Tor-mediated control of autophagy may occur through at least 2 different mechanisms: direct phosphorylation of Apg13 and regulation of transcription by controlling the activation of phosphatases that regulate downstream transcriptional activators. As a general example, Tor phosphorylates the regulatory subunit Tap42 allowing it to bind and inhibit the PP2A-related Sit4 phosphatase. 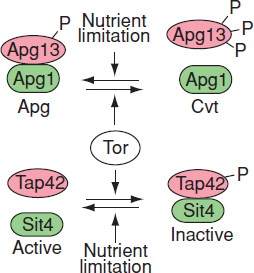 Inhibition of Tor allows the dissociation of Tap42 from Sit4; the activated Sit4 can now dephosphorylate and activate a regulatory protein that controls transcription of components that are required for autophagy. In autophagic induction, however, this process may be controlled by a regulatory subunit other than Tap42. Tor also causes the hyperphosphorylation of Apg13, which reduces its affinity for Apg1 and inhibits autophagy. When approaching the functional aspects that differentiate autophagy and the Cvt pathway, it is helpful to remember a fundamental difference: Sequestration in the Cvt pathway is selective whereas autophagy is nonspecific. Furthermore, there are proteins that are required for 1 process but not the other. Accordingly, understanding the mechanism of cargo selection appears to be crucial in understanding the relationship between autophagy and the Cvt pathway or other types of selective autophagy. Finally, it is important to keep in mind that selective autophagy is critical in the normal function of mammalian cells; the specific degradation of peroxisomes, and probably other organelles such as mitochondria, is a highly regulated process. The Cvt pathway specifically transports 2 hydrolases, prApe1 and α-mannosidase (Ams1), to the vacuole (11). A coiled-coil protein termed Cvt19 binds to both hydrolases and functions as a receptor (12). Recently, 2 studies have uncovered the molecular basis of the specific sequestration events in the Cvt and autophagy pathways (13,14). Using the green fluorescent protein (GFP) fused to prApe1 as a reporter for the Cvt pathway and autophagy, these studies showed that Cvt19 is recruited to the Ape1 complex (precursor Ape1 dodecamers that have undergone additional assembly into a large oligomeric complex) through the binding between its coiled-coil domain and the prApe1 propeptide (Figure 5). Interestingly, Cvt19 does not function as a conventional receptor. For example, the formation of the Ape1 complex is not dependent on Cvt19, but Cvt19 recruitment to the site of vesicle formation requires the presence of prApe1, the transport cargo protein (13). That is, the putative receptor does not concentrate the cargo, but rather, the opposite occurs. Furthermore, Cvt19 is not a transmembrane protein, and it is not recycled as is the case in most other receptor-mediated transport pathways; Cvt19 is packed together with prApe1 inside the sequestering vesicle and is transported to the yeast vacuole where it is degraded (12,13). Nonetheless, Cvt19 is required for specific import of prApe1 and Ams1 through both the Cvt and autophagy pathways. 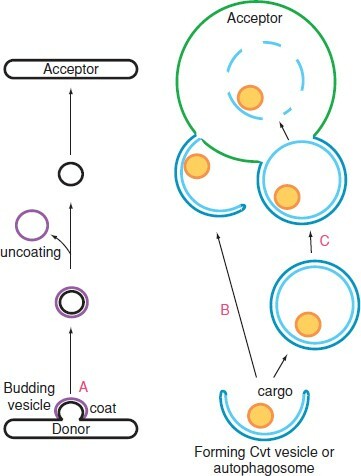 Schematic models for cargo selection and Cvt vesicle formation. The Cvt pathway selectively transports the vacuolar hydrolases aminopeptidase I (Ape1) and α-mannosidase (Ams1) into the yeast vacuole. Precursor Ape1 (prApe1) is synthesized in the cytosol, forms dodecamers, and is further assembled into an Ape1 complex composed of multiple dodecamers. The propeptide region of prApe1 is recognized by its receptor Cvt19, which independently recruits Ams1. This process is termed the cargo selection step for the Cvt pathway. Cvt9 subsequently binds to the complete Cvt complex (Cvt19 bound to cargo) and mediates the tethering step of the Cvt pathway. When the Cvt complex reaches its destination, the perivacuolar preautophagosomal structure (PAS), Cvt19 further interacts with Aut7 accompanied by the release of Cvt9. The Cvt19-Aut7 interaction ensures that the cargo proteins are packaged inside the forming Cvt vesicle. Neither prApe1 nor Cvt19 have mammalian homologues. Another Cvt-specific protein, Cvt9, also lacks a mammalian homologue. In the glucose-dependent pexophagy pathway in P. pastoris, the Cvt9 homologue, Gsa9, is proposed to mediate the tethering step for peroxisome sequestration by the vacuole (15). Likewise, Cvt9 binds to Cvt19 through a C-terminal domain of Cvt19 and, interestingly, without Cvt9, GFP-Apel and Cvt19 colocalize but are not delivered to the site of vesicle formation (see below) (13). This result suggests that Cvt9 plays a role as an adaptor and/or tethering factor that mediates the delivery of the assembled receptor-cargo complex (termed the Cvt complex) to the site where the sequestering Cvt vesicle forms. Because Cvt9 is not needed for autophagy, another protein may replace this function of Cvt9 under starvation conditions. In addition to binding sites for the cargo proteins prApe1 and Ams1, and the Cvt9 protein, the extreme C terminus of Cvt19 contains an Aut7 interaction domain (13). Aut7 is a soluble ubiquitin-like protein that undergoes a novel lipid conjugation to phosphatidylethanolamine (PE; see below). The covalent attachment to PE results in a form of Aut7 that is tightly membrane associated. 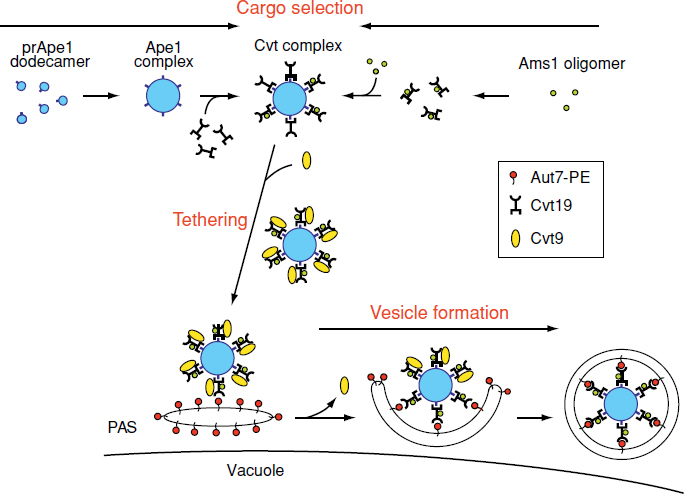 The membrane bound form of Aut7 might have 2 roles, one in cargo selection/cargo routing and another in vesicle formation. Thus, once the cargo-receptor complex has arrived at the site of vesicle formation (the preautophagosomal structure, see below), Cvt19 appears to further mediate the membrane sequestration event through interaction with Aut7-PE. Because Cvt19-Cvt9 is able to target prApe1 to this site in the absence of Aut7, a component other than Aut7 might directly interact with Cvt19 or Cvt9 to mediate the localization of the Cvt complex. Although the covalent attachment of PE to Aut7 is the 1st example of such a linkage, it seems likely that additional modifications of this type will be uncovered. The only other resident hydrolase that has been shown to utilize the Cvt pathway is Ams1. Interestingly, Ams1 forms a cytosolic oligomer similar to prApe1 suggesting that a function of the Cvt pathway is the vacuolar delivery of oligomeric hydrolases. The delivery of Ams1 to the vacuole is also Cvt19-dependent (12). An updated model of cargo selection for prApe1 and Ams1 and the recruitment of the Cvt complex for vesicle formation is shown in Figure 5. Whereas some of the cargo selection and tethering components (such as Cvt19 and Cvt9) are missing in higher organisms, equivalent proteins presumably play a role in mammalian cells in recognizing organelles that have been tagged for degradation. Over the past 5 years, many proteins required for the autophagy and Cvt pathways have been identified and characterized (see Table 1). Interestingly, most proteins that are proposed to function during the vesicle formation/completion stage are not transmembrane proteins; however, they colocalize at a perivacuolar structure (16,17). This structure does not cofractionate with any of the standard endomembrane markers. Recently, this site has been termed the preautophagosomal structure (PAS). This structure normally appears as a single dot by fluorescence microscopy when yeast cells express fluorescent marker (GFP)-tagged Apg or Cvt proteins. The PAS localizes adjacent to the vacuole. It does not appear to be a mobile structure based on fluorescent microscopy studies. Furthermore, electron microscopy data suggest that the PAS may not be associated with a membranous structure. Accordingly, the PAS is thought to represent a novel organization center that is involved in vesicle biogenesis for the Cvt and autophagy pathways. At present, there is no information that addresses whether mammalian cells utilize a preautophagosomal structure. Part of the problem is that only 2 of the mammalian autophagy proteins have been localized by GFP-tagging and the fluorescent staining pattern is more complicated than that seen in yeast. We discuss several events that are associated with autophagy and the Cvt pathway that involve at least transient delivery of proteins to the PAS. Autophagy in both mammalian and yeast cells is sensitive to wortmannin and 3-methyladenine, inhibitors of PtdIns 3-kinase activity. Yeast has only 1 PtdIns 3-kinase, Vps34, but there appear to be 2 separate complexes containing this protein. Vps34 functions together with Vps15 and Apg6/Vps30. This complex is thought to be targeted to the trans-Golgi via an interaction with Vps38 where it participates in protein trafficking from the Golgi to the endosome. 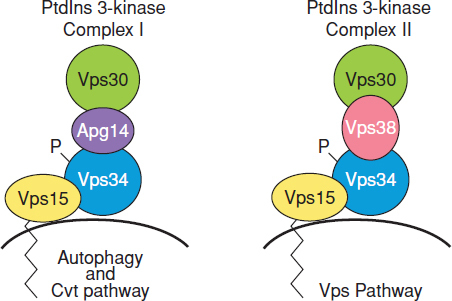 Recently, Kihara and others demonstrated that a less abundant pool of the Vps34-Vps15-Apg6/Vps30 complex controls autophagy through association with Apg14 (18) (Figure 6). The Apgl4-containing PtdIns 3-kinase complex localizes at the vacuole membrane and the PAS. Two PtdIns 3-kinase complexes. Both complexes contain Vps34, Vps15, and Apg6/Vps30. Complex I also has Apg14 and is used primarily in the Cvt and autophagy pathways. Complex II contains Vps38 and functions in the Vps pathways that target proteins to the vacuole through a portion of the secretory pathway; most resident vacuolar hydrolases transit from the ER to the Golgi complex and are then diverted away from the secretory pathway and targeted to the vacuole, usually via an endosomal intermediate. Modified from Stromhaug and Klionsky (55). The role of this Cvt and autophagy specific PtdIns 3-kinase complex is not clear; however, PtdIns(3)P is proposed to function as a secondary messenger to recruit proteins to a specific microdomain. Thus, an obvious question is, what are the effectors of this PtdIns 3-kinase complex? Two Phox homology (PX) domain-containing proteins, Cvt13 and Cvt20, have been identified recently as Cvt pathway-specific proteins (19). Their PX domains are essential to target these 2 proteins to the PAS and appear to be required for their function in the Cvt pathway. Interestingly, Cvt13 and Cvt20 form a complex with each other and with Apg17, an autophagy-specific protein that interacts with the protein kinase Apg1 (19). Therefore, Apg1 kinase activity and/or the Apg1 complex might be regulated through PtdIns(3)P (see below). The hydrolase carboxypeptidase Y is delivered to the vacuole in a Vps34-dependent manner. Wurmser and others used a genetic approach to identify suppressors of a vps34 mutant that missorted this hydrolase. They identified a type II transmembrane protein, Etf1; this protein might function as another PtdIns 3-kinase effector that is required for the Cvt pathway but not autophagy (20). Etf1 might localize to the PAS and has been reported to physically interact with Aut7-PE, although its role in the Cvt pathway is not known. Furthermore, Apg6/Vps30 and Apg14 are required for the proper localization to the PAS of several other identified machinery including the 2 protein conjugates Apg12-Apg5 and Aut7-PE, which are proposed to act as a structural framework during vesicle formation at the PAS (see below). Along this line, PtdIns 3-kinase activity and its effectors might be involved in regulating the size of sequestering vesicles and/or determining the type of vesicles that form by coordinating the membrane sequestration events through the conjugation systems and the Apg1 complex. Unlike budding from a pre-existing organelle, such as the endoplasmic reticulum, one critical aspect of vesicle biogenesis in the Cvt/Apg pathways is vesicle nucleation. That is, how does the vesicle initially begin to form? Two processes involving conjugation of ubiqutin-like proteins play a critical role in autophagy and the Cvt pathway; the proteins involved in these processes are required for vesicle completion and possibly also nucleation. The 1st characterized conjugation process is the formation of an isopeptide bond between a C-terminal glycine of Apg12 and an internal lysine of Apg5. This process involves Apg7, a homologue of the E1 ubiquitin activating enzyme Uba1, and Apg10, which is analogous to an E2 ubiquitin conjugating enzyme (21). Reminiscent of the ubiquitin system, the process starts with the formation of a thioester bond between Apg7 and Apg12 in a reaction that activates Apg12 through the hydrolysis of ATP. Subsequently, the activated Apg12 is transferred to the E2 enzyme Apg10 before it is eventually conjugated to Apg5 (Figure 7A). A small coiled-coil protein, Apg16, specifically binds noncovalently to the Apg12-Apg5 conjugate and undergoes self-multimerization resulting in a 350-kDa complex (22). These 5 proteins localize in part to the PAS where they are proposed to function during the vesicle formation stage. This conjugation system is conserved from yeast to mammals and plays a critical role in autophagy and its related pathways. Two conjugation systems and the Apg1 regulatory complex are required for vesicle formation. A: Apg12-Apg5 conjugation. Apg12 is activated by an ubiquitin activating enzyme E1 homologue, Apg7, through the formation of a thioester linkage through a C-terminal glycine of Apg12. The activated Apg12 is then transferred to the E2 enzyme Apg10. Finally, Apg10 transfers Apg12 to Apg5 resulting in the formation of a stable isopeptide bond between Apg12 and an internal lysine residue of Apg5. The Apg12-Apg5 conjugate binds to Apg16. Apg16 undergoes tetramerization resulting in a multi-conjugate complex that is required for autophagosome and Cvt vesicle formation. B: Aut7 lipid conjugation. Prior to Aut7 conjugation, the carboxyl-terminal arginine (R) residue of Aut7 is proteolytically removed by a cysteine protease, Aut2. The exposed glycine (G) residue of Aut7 is activated by the E1-like enzyme Apg7, and subsequently transferred to an E2 enzyme, Aut1. Aut7 is finally conjugated to PE by the formation of an amide bond between PE and Aut7. The resulting Aut7-PE conjugate allows Aut7 to be tightly associated with membrane that is involved in autophagosome and Cvt vesicle formation. A pool of Aut7 is subsequently cleaved from PE by the action of Aut2. C: The Apg1 regulatory complex. The Cvt pathway and autophagy are controlled by nutrient conditions through the Tor pathway. Under nutrient rich conditions, Tor kinase is active, and Apg13 is maintained in a hyperphosphorylated state resulting in a weak association with Apg1 kinase. Apg13 is only required for autophagy and physically associates with Vac8 that is only required for the Cvt pathway. Apg1 kinase also is phosphorylated and physically interacts with the Cvt pathway specific protein Cvt9 and the autophagy specific protein, Apg17. Apg17 associates with 2 additional Cvt specific proteins, Cvt13 and Cvt20, both of which contain PX domains that bind PtdIns(3)P. The phosphorylation state of Cvt13, Cvt20, and Apg17 is not known. Dephosphorylated Apg13 shows enhanced interaction with Apg1 under starvation conditions. Modified from Khalfan and Klionsky (56). Although the Apg12-Apg5 protein complex is not detected on the completed autophagosome, fluorescent microscopy studies in mouse embryonic stem cells reveal that these proteins are associated with the forming autophagosome (23). The Apg12-Apg5·Apg16 complex appears to dissociate from the nascent vesicle just prior to, or immediately following, completion. Based on electron microscopy, the completed autophagosome and Cvt vesicle do not appear to be coated in the cytosol. These observations suggest that the Apg12-Apg5-Apg16 complex may function as a coat that drives the deformation of the sequestering membrane; during vesicle formation, it is generally thought that coat proteins lining the outer surface of the membrane enforce the curvature that is necessary to generate a spherical structure. Another possible role for the Apg12-Apg5·Apg16 complex would be to prevent premature fusion of the forming vesicle with the vacuole. Because of their formation in the cytosol, there are no clear limitations on the movement, and potential fusion, of Cvt vesicles and autophagosomes with the vacuole. Fusion prior to vesicle completion, however, would not result in delivery of the cargo to the vacuole lumen (Figure 8). In contrast, it is not necessary to prevent fusion of vesicles that are formed by budding from a preexisting organelle because those vesicles are physically tethered to the donor compartment and are prevented from prematurely contacting the acceptor organelle. If the Apg12-Apg5·Apg16 complex functions as a coat, it is not known how the uncoating process is triggered in response to vesicle completion. Fusion of Cvt vesicles and autophagosomes with the lysosome/vacuole must be regulated. A: Vesicles that bud from a donor organelle are physically tethered to the organelle and prevented from prematurely fusing with the acceptor compartment. Coat proteins drive the curvature and budding of the vesicle and must be removed prior to the final fusion with the acceptor compartment. B: Cvt vesicles and autophagosomes may not form from a pre-existing organelle and accordingly are free to diffuse in the cytosol. Fusion prior to vesicle completion would not result in delivery of the cargo into the lumen of the acceptor compartment. C: Normally the Cvt vesicle and autophagosome are completed prior to fusion with the lysosome/vacuole. This results in delivery of the cargo into the lumen of the acceptor organelle. It is not known if coat proteins are involved in regulating this process. Another issue regarding the sequestering vesicles concerns the factors that control vesicle size; the autophagosome has anywhere from 8- to 200-fold the volume of a Cvt vesicle. It is possible that the Apg12-Apg5 conjugate is the key control factor for both pathways. For example, the level of these conjugates might determine the size of the sequestering vesicles. However, recent data indicate that the majority of Apg12 in the cell is in the form of an Apg12-Apg5 conjugate, and the protein level of both Apg12 and Apg5 is not significantly increased under starvation conditions when autophagy is induced (22). Thus, it seems unlikely that the Apg12-Apg5·Apg16 complex is involved in regulating the size of the sequestering vesicles. Mammalian homologues of Apg12 and Apg5 have been identified, shown to be conjugated in a similar manner to the yeast orthologs, and are required for autophagy (23). It should be noted that an apoptosis-specific protein known as p45 ASP in mammalian cells was suggested to be the mammalian homologue of Apg5. Recent data, however, indicate that p45 ASP and hApg5 are distinct proteins (24). The most attractive candidate for a protein that functions as a structural component that in part controls the size of the autophagosome and Cvt vesicle is a 2nd ubiquitin-like protein, Aut7. Aut7 was originally characterized as a microtubule-associated protein and proposed to function together with Aut2 in transporting the completed autophagosome to the vacuole (25). However, further studies do not support this role for Aut7. 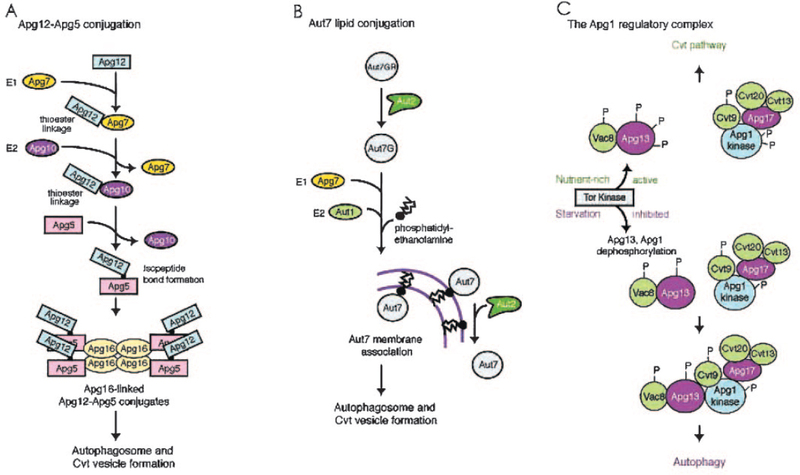 Aut7/Apg8 is part of the 2nd identified conjugation machinery required for autophagy and the Cvt pathway (26, 27, 28, 29). After the exposure of the C-terminal glycine residue of Aut7 by the enzymatic activity of the cysteine protease Aut2, the E1 enzyme Apg7 activates Aut7 and transfers it to the E2 analogue Aut1. Eventually, Aut7 is conjugated to phosphatidylethanolamine via the formation of an amide bond (see Figure 7B). It is not known where this conjugation event takes place, but the lipidation process allows Aut7 to be tightly associated with membrane. Aut7 is required for formation of the Cvt vesicle; prApe1 is not sequestered within an enclosed vesicle in the aut7 mutant under nutrient-rich conditions (29). Unlike the Apg12-Apg5·Apg16 proteins, Aut7 is associated with the completed vesicle although a portion of Aut7 is liberated from the membrane during the vesicle formation process through a 2nd cleavage event involving Aut2 (27). One difference between the formation of Cvt vesicles and autophagosomes is that Aut7 is essential for the formation of the Cvt vesicle, but it does not appear to be absolutely required for formation of the autophagosome; prApe1 is delivered to the vacuole in an aut7 mutant under starvation conditions. Aut7 levels are dramatically induced during starvation (27,29). When Aut7 synthesis is blocked by cycloheximide under starvation conditions or in an aut7Δ mutant, small autophagosomes are observed, suggesting a role for Aut7 in the expansion step. This observation, coupled with the large size of the autophagosome led to the hypothesis that Aut7 is required for expansion, but not the nucleation (that is, the initiation of formation), of the autophagosome membrane (30). The 2 different requirements for Aut7 in the Cvt pathway (vesicle nucleation/formation) and autophagy (vesicle expansion) are one of several lines of evidence suggesting fundamental differences in the vesicle formation process between these pathways. A GFP-Aut7 fusion protein is detected at the PAS (16,17). The localization of Aut7 to the PAS is dependent on the Apg12-Apg5 conjugation machinery, proteins essential for Aut7 conjugation, and the previously described PtdIns 3-kinase activity. There are 3 mammalian Aut7 homologues, GATE-16, GABARAP, and microtubule-associated protein light chain 3 (LC3). Among them, a specific spliced form of LC3 is enriched in starved rat liver and is specifically associated with the autophagosome membrane. These results suggest that LC3 is a functional Aut7 mammalian ortholog (31). A recent study in mammalian cells also revealed a role for human Aut1/Apg3 as an E2 enzyme for all 3 Aut7 homologues (32). The nature of potential cross-talk between the Apg12-Apg5 and Aut7 conjugation systems remains an open question. Apg1 is a serine/threonine protein kinase that is required for vesicle formation in both autophagy and the Cvt pathway (33). The function of Apg1 is not known, but there is some evidence that this protein is involved in regulating whether the cell produces a Cvt vesicle compared with an autophagosome. GFP-tagged Apg1 localizes to the PAS, but it is not known if this is where it carries out its function. Environmental cues appear, in part, to be transduced to Apg1 though its physically associated counterpart, Apg13 (34) (Figures 4 and 7C). Both proteins are phosphoproteins and Apg13 is hyperphosphorylated in nutrient-rich conditions (35). It has been proposed that dephosphorylation of Apg13 in starvation conditions (or following inhibition of Tor by rapamycin) leads to a stronger physical association between Apg1 and Apg13, and a subsequent increase in Apg1 kinase activity (based on in vitro phosphorylation of an artificial substrate) (34). Apg1 kinase activity therefore has been proposed to regulate the conversion from the Cvt pathway to autophagy. The target of the Apg1 kinase is not known, however Apg1 undergoes autophosphorylation, and the in vitro autophosphorylation of Apg1 is inhibited under autophagy conditions (33). Thus, the in vitro data on Apg1 kinase activity are somewhat contradictory; under starvation conditions, Apg1 kinase activity toward an artificial substrate (myelin basic protein) is increased, whereas activity toward an endogenous substrate (itself) is decreased (34). 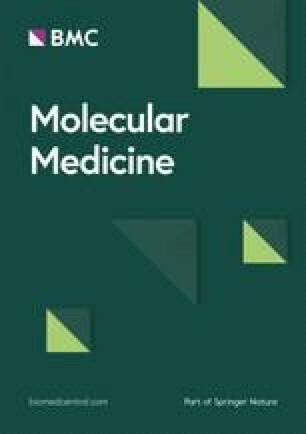 To further address the requirement of Apg1 kinase activity in the Cvt pathway and autophagy, a chemical genetic approach was used to generate an allele of Apg1 that is specifically sensitive to an exogenous kinase inhibitor in vivo (30). The results revealed that inhibition of kinase activity inhibited the Cvt pathway but not autophagy, suggesting that Apg1 kinase activity is not essential for autophagy. It should be noted that the Apg1 protein is required for both autophagy and the Cvt pathway. Thus, these results suggest a nonkinase role for Apg1 in inducing autophagy. Further experiments will be needed to clarify the role of Apg1 in these 2 pathways. However, the apparent difference in the requirement for Apg1 kinase activity is a 2nd line of evidence pointing to substantial differences between the formation of Cvt vesicles and autophagosomes. In addition to Apg13, several other proteins have been found to associate with Apg1 and thus may play important regulatory roles under different conditions (see Figure 7C). Based on two-hybrid studies and coimmunoprecipitation of overexpressed proteins, Apg1 physically interacts with 2 additional proteins, Apg17 and Cvt9 (34,35). Interestingly, Apg17 is only required for autophagy, whereas Cvt9 is specific for the Cvt pathway. Apg13 also interacts with at least 1 additional protein, Vac8, that is only required for the Cvt pathway. Therefore, these factors comprise a putative complex that might play a role in regulating the conversion between both pathways through permanent or transient interactions. Recently, 2 additional proteins, Cvt13 and Cvt20, were identified that also may comprise part of the machinery that interacts with Apg1. Although most published models depict a complex composed of Apg1, Cvt9, Apg17, Apg13, and Vac8, it should be noted that this holo-complex has not been demonstrated to exist. In fact, studies with protein A-tagged Apg1, along with proteomic analyses, have failed to identify any proteins present at stoichiometric levels in a stable complex with Apg1 (30,36). Thus, it remains to be determined whether there is a single Apg1 complex or subcomplexes comprised of various proteins, whether these components associate transiently or stably with Apg1, whether the associations are nutrient-dependent and the role of such interactions. Apg1 and Cvt9 have been shown to colocalize to the PAS, and other proteins that are thought to be associated with Apg1 are likely to be at least transiently associated with this compartment (16,17). There are 2 putative human homologues of Apg1, ULK1, and ULK2. ULK1 has been shown by the two-hybrid system to interact with GATE-16 and GABARAP, 2 of the putative Aut7 homologues (37). The Apg1 complex is not required for formation of the Apg12-Apg5 or Aut7-PE conjugates or for recruiting them to the PAS in yeast, however, a potential role of the Apg1 complex in regulating the function of these conjugates during vesicle formation remains to be determined. Because the conjugation proteins appear to have a structural role during vesicle formation, we propose that Apg1 may coordinate their action to regulate vesicle size (17). Apg9 is a membrane protein that is required for both the Cvt pathway and autophagy. A population of Apg9 localizes to the PAS and Apg9 physically interacts with, and is needed for, the localization of another PAS protein, Apg2 (17,38). Both Apg2 and Apg9 are proposed to function at the stage of vesicle nucleation/completion (38, 39, 40). Localization of Apg2 to the PAS also is dependent on Apg1; however, there is no evidence that Apg9 or Apg2 are part of the Apg1 complex (38, 39, 40). Because Apg9 appears to be a transmembrane protein that not only localizes at the PAS but other putative vesicular structures as well, it is possible that delivery of Apg9 to the PAS also results in the delivery of the associated vesicular membrane that can participate in the Cvt vesicle/autophagosome nucleation process (see below). The localization of Apg2 to the PAS also requires Apg14, the component of the Cvt/Apg-dependent PtdIns 3-kinase complex (see Figure 6). Neither Apg2, Apg9, nor the Apg1 complex components can be detected in the completed autophagosome or Cvt vesicle, which implies that they may need to be recycled during or after vesicle formation. One of the fundamental questions with regard to autophagy and the Cvt pathway concerns the origin of the membrane that forms the sequestering vesicle and the mechanism of vesicle formation. One possibility is that the Cvt vesicle or autophagosome forms de novo and that vesicle formation takes place at the PAS. However, a complete de novo mechanism seems unlikely because the process of autophagosome and Cvt vesicle formation appears to involve the ER or Golgi complex, respectively (see below). Hence, we suggest that formation of autophagosomes and Cvt vesicles might initiate from the modification of a pre-existing structure. Of the components required for vesicle formation, Apg9, is the only integral membrane protein that localizes to the PAS, and interestingly Apg9 does not appear to be recruited to the forming vesicles (40). It has been shown that in vps4Δ cells that accumulate an exaggerated prevacuolar/endosomal compartment, Apg9 does not localize to this structure, suggesting that the PAS is not the late endosome (40). Additional studies on Apg9 are underway because further information regarding the localization of this protein might reveal the source of sequestrating membrane for both pathways. In mammalian autophagy, the source of the autophagosome membrane has been under debate for many years. An attractive model suggests that the membrane source is a ribosome-free region of the rough ER (2). In yeast, COPII components that play a role in the budding of vesicles that transit between the ER and Golgi complex, such as Sec12, Sec16, Sec23, and Sec24, have been shown to play a role in autophagosome formation but mutations in the corresponding genes do not result in a defect in the Cvt pathway (41). These data imply a difference in membrane flow during nutrient-rich and starvation conditions. Consistent with this hypothesis, a group of proteins including the Vps Fifty Three (VFT) tethering complex, which is composed of the Vps51, Vps52, Vps53, and Vps54 proteins that mediate the retrieval step from the endosome to the Golgi complex, is only required for the Cvt pathway and is dispensable for autophagy (42). A recent study reveals that this protein complex plays an important role in recruiting the Cvt cargo-receptor complex prApe1-Cvt19 to the PAS. Furthermore, localization of Cvt9, the proposed tethering factor for prApe1-Cvt19, is defective in VFT mutant strains (42). The difference in contributions from the ER and Golgi complex constitute a 3rd example that illustrates basic differences between the formation of Cvt vesicles and autophagosomes. The requirement of different membrane trafficking flow for each pathway implies at least 2 possibilities for the membrane source: 1) different starting membrane is delivered to the PAS under the control of nutrient conditions, thus causing the formation of different vesicles or 2) the membrane source is identical; however, the regulation of protein sorting to/from the PAS is different and acts as a determinant for the size and specificity of each vesicle type. The actual situation is probably not as simple as implied by the 1st model, because proteins such as Apg9 that are thought to mark the donor membrane are required for both pathways. In addition, many proteins that are proposed to play regulatory roles may be directly or indirectly regulated through Apg9. We suggest a nucleation event that takes place at the Apg9-containing compartment is required for both pathways, and membrane expansion is only essential for autophagy. We propose that the nucleation event is under control of machinery located at the PAS. As discussed previously, PtdIns 3-kinase activity functions upstream in the formation process because it recruits as least 2 important regulators of the formation machinery: the 2 conjugation products, Apg12-Apg5 and Aut7-PE, and components of the Apg1 regulatory complex (17). These 2 sets of machinery might cross-talk in a manner that allows regulated integration of their respective functions. Whereas the 2 conjugation machineries are proposed to play a structural role as membrane modifiers, the regulatory complex might function as the signal sensor to determine the size of the vesicle and possibly to nucleate the action of the conjugation machinery. The sealing mechanism involved in the final closure of Cvt vesicles and autophagosomes is still a mystery, however, several events are probably required to take place right before/at this step. One key event may be sorting and removal of Apg9, and this may cause the disassembly of the regulatory complex or the activation of the sealing complex. Alternatively, the latter could be achieved by further modification/breakdown of PtdIns(3)P on the forming vesicles. As we proposed that the Apg12-Apg5.Apg16 conjugates might function as a vesicle coat, after vesicle completion, uncoating (release of Apg12-Apg5·Apg16 and/or release of Aut7-PE by Aut2 cleavage) will expose the fusion machinery and allow fusion with the vacuole. 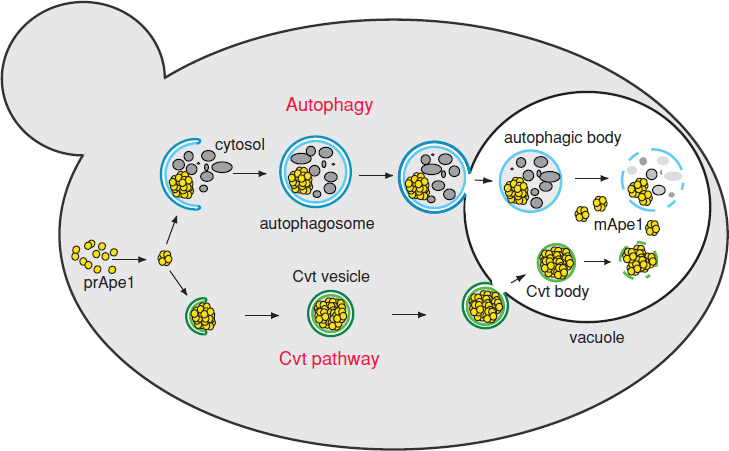 We have reasoned that vesicle biogenesis for the 2 pathways appears to be crucial in understanding the relationship between autophagy and the Cvt pathway. Progress is being made in identifying the membrane source(s) and the regulatory processes for both pathways. While identification of the PAS structure has provided a significant advance, many proteins that appear to function at this location are only now being separated into working groups. Figuring out the connections among these groups will provide a clearer picture of these nonclassical protein sorting processes. The fusion of autophagosomes and Cvt vesicles share most components that also are involved in other targeting pathways destined to the yeast vacuole. Theses components include the SNARE proteins Vam3, Vti1, and Vam7, the yeast N-ethylmaleimide-sensitive factor Sec18, the yeast α-SNAP Sec17, the Rab GTPase Ypt7, and 2 recently characterized proteins, Mon1 and Ccz1 (43, 44, 45, 46, 47). Similar to other trafficking pathways, the vacuole fusion specificity is not only dependent on the SNAREs but also on the particular tethering complex. Accordingly, the class C Vps complex that functions in concert with Ypt7 during the tethering/docking stage of multiple yeast vacuole delivery pathways also is required for the Cvt pathway and autophagy (48, 49, 50). After fusion, both the Cvt and autophagy pathway release a single membrane Cvt or autophagic body inside the vacuole lumen (see Figure 3). The breakdown of the autophagic or Cvt bodies in the vacuole lumen depends on both proper vacuolar function and specific proteins. Besides vacuolar acidification and the activity of the vacuole resident proteinase B and proteinase A, at least 2 specific components are involved in this process (51). Cvt17/Aut5 is a putative lipase and Aut4 has homology with permeases (52, 53, 54). They are both integral membrane proteins, however, Cvt17 and Aut4 do not appear to be localized in the inner membrane of the autophagosome or Cvt vesicle. How these 2 proteins contribute to the recognition and degradation of the Cvt/autophagic bodies remains unclear. Autophagy is an evolutionally conserved membrane trafficking pathway that occurs in all eukaryotes. It involves dynamic membrane rearrangements to allow the sequestration of cytoplasm and its subsequent delivery to the lysosome or vacuole. This process is 1 type of cellular response to stress conditions. Autophagy is also a type of programmed cell death that plays a role in normal developmental pathways. In addition, defects in autophagy have been linked to a wide range of diseases in mammalian cells indicating that autophagy is crucial in physiology. Continued studies of autophagy and the related cytoplasm to vacuole targeting pathway in yeast will provide further information to elucidate the regulation, mechanism, and roles of this process in eukaryotic cell biology. The work was supported by National Institutes of Health Public Health Service Grant GM53396 (to DJK) and the Lewis E and Elaine Prince Wehmeyer Trust (to C-WW).